Archives : MARKET CRACKS ON GLOBAL WEAKNESS - 01/08/2014. MARKET CRACKS ON GLOBAL WEAKNESS – 01/08/2014. MARKET NEEDED A REASON TO CORRECT. It was the start of the August series and in the absence of domestic cues and a weakening Rupee; our markets mimicked the global markets and cracked. Sensex lost more than 400 points on Friday. As pointed out in the previous weeks article the market, even though at life highs, lacked conviction; as the market breadth was extremely narrow and a correction was looming large on the market. That was exactly the way the market behaved this week. The market was trying to find a reason to correct and it found that in the global market weakening. Sensex opened the week at 26173, made a high of 26181, low of 25459 and closed the week at 25480. Thus it closed the week with a loss of 646 points. At the same time the Nifty opened the week at 7792, made a high of 7799, low of 7593 and closed the week at 7602. Thus the Nifty closed the week with a loss of 188 points. Both the indices have formed a black body candle after a gap down opening on Friday. On the weekly chart both the indices have formed a black body Marubuzo which is Engulfing the previous weeks white candle. Thus both daily as well as weekly candlestick pattern suggests bearishness in the near term. Last week the Bearish Rising Wedge pattern got negated and now the prices are moving in a Rising Channel. A close below Sensex 25221 and Nifty 7559 will complete the bearish Rising Channel pattern and the target as per that pattern will be at Sensex 23799 and Nifty 7044. Market has started correction after registering a high of Sensex 26300 and Nifty 7840. The immediate correction levels are placed at Sensex 25484-25231-24979 and Nifty 7564-7479-7394. The 61.8% correction level forms a confluence zone with intermittent bottoms at Sensex 24892 & 24878 and Nifty 7441 & 7422. Thus this confluence zone between Sensex 24979-24878 and Nifty 7441-7394 will act as strong Support zone for the market. This week both Sensex and Nifty closed below the short term average of 20dma (Sensex – 25709 and Nifty – 7670). Both the indices are still above the medium term average of 50dma (Sensex – 25361 and Nifty – 7574) and the long term average of 200dma (Sensex – 22393 and Nifty – 6674). Thus the trend in the short term timeframe has turned down whereas the trend in the medium term and long term timeframe continues to remain up. MACD has managed to give a Sell signal despite being in positive territory. Meanwhile Price ROC continues to be positive and hence in Buy mode. RSI (47) has breached the equilibrium line and has generated a fresh Sell signal. Stochastic Oscillator %K (67), continues in Sell mode as it remains below %D. ADX has dropped slightly to 31, which suggests that the prevailing uptrend has still some strength. The Directional Indicators continue in Buy mode as +DI remains above –DI, but they have converged. OBV remains sideways and hence does not confirm to the current upward price movement. Interestingly both RSI and MACD have confirmed negative divergence of the second order. Thus Oscillators are suggesting bearish bias in the near term. Option writing for the current month series suggests support coming in at 7300 and resistance at 8000. Friday saw strong Call writing at 7700 strike which indicates immediate resistance at that level. 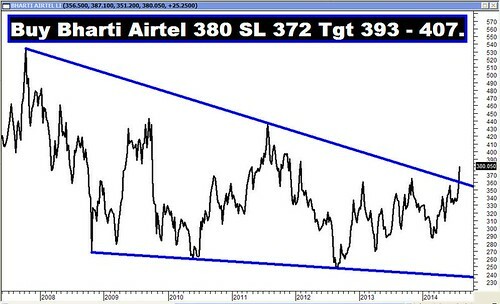 Strong Trendline Support for the Sensex is at 25221. Trendline Resistance for the Sensex is at 26345. Strong Trendline Support for the Nifty is at 7559. Trendline Resistance for the Nifty will be at 7853. For the week ahead, Sensex will find Support at 25175-24878-24587 and Resistance will be at 25850-26190-26518. For the week ahead, Nifty will find Support at 7504-7422-7353 and Resistance will be at 7707-7840-7959.